You can add a neutral player or 2 to achieve much more success. To begin, have all players outside the boxes. 3v1 in each box. Team with possession of the ball can go inside of box and play 3 v1. All three players touch the ball and then can exit by playing to a target player outside of the box (no dribbling out to encourage passing), immediately the other opened players try to get into another box. Af first, each team gets a goal for making 3 consecutive passes inside EACH box. 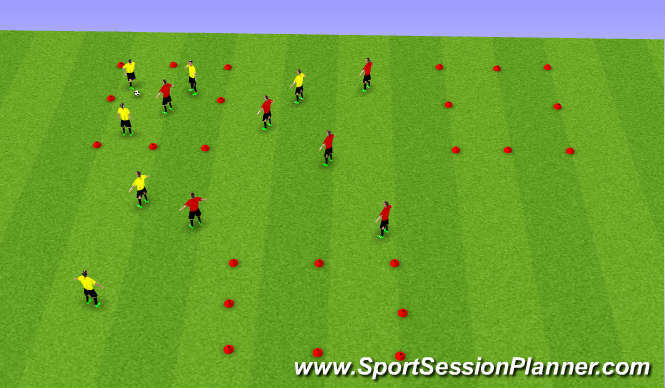 Progression, you get a goal after playing successful (without lossing the ball) possession in each box. You get a goal after you complete the 3rd box. If defender steals the ball, he can play out of the box to a teammate target player and can proceed to another box and continue until possession is lost. 1. Creativity with and without the ball. 2. Movement without the ball. 3. Combination plays in tight spaces. 5. Short and quick passes to maintain possession.